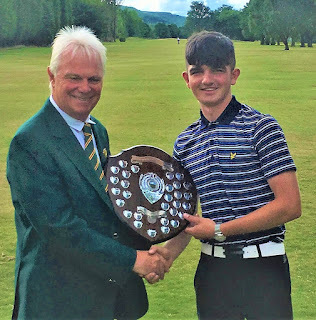 It was a double stroke-play success for Clydebank and District Golf Club with Kyle Murphy winning the Dumbartonshire Golf Union boys' stroke-play championship at Clober Golf Club to go with the men's title won earlier in the month by Scott Moore. Kyle had rounds of 70 and 68 for a total of 138 with the home club’s junior champion, Jack Pike, in second place on 139 (73 and 66). Kyle is pictured with DGU President Alan Bell.